Soprano Mhairi Lawson’s career has taken her to some of the most exquisite music venues in the world, including the theatre at the Palace of Versailles and the Barbican in London. Roundly lauded, Mhairi has attracted rave reviews throughout her career, with the BBC Music Magazine commenting: “Soprano Mhairi Lawson proves as unfailingly beautiful in tone as she is neat in execution”; and The Times newspaper saying: “True Handelian style surfaces in the voice of Mhairi Lawson”. However, this month, the 51-year-old will take on a gig with a difference, in Trinity Church, in her home town of Galashiels, on Tuesday, June 26. The former pupil of Balmoral Primary and Galashiels Academy told us: “It is more of a warm-up gig ahead of appearing at the East Neuk Festival in Fife on June 28, which is being recorded for BBC Radio 3. “But it is also a chance to make some money for local charities – half will go to the church, where my parents are elders, and the other half will go to the My Name’5 Doddie Foundation for MND research. For the Trinity Church concert, which is entry by donation, Mhairi will be joined by Dorothy Howden on piano and Paula Chateauneuf on theorbo. Among the songs Mhairi is planning to perform are Mary Stewart’s Lament by Carissimi and Mad Bess by Henry Purcell. And she would know. Her “other” job is professor of voice and historical performance at the Guildhall School of Music and Drama in London. Her most recent European tour was with Henry Purcell opera King Arthur, with a British group, during which she played the theatre at the Palace of Versailles. And in March, she performed Oratorium by Haydn – the piece depicting the creation of the world – in Tromsø, Norway. Mhairi said: “That was really special, as we were treated to a lovely show of the Northern Lights as well ... incredibly spectacular. 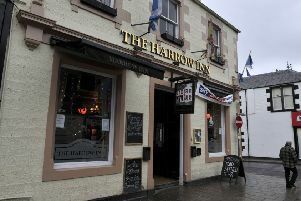 The “Cocktail Hour” takes place at Trinity Church in High Street, Galashiels, at 5pm on Tuesday, June 26. And if you get there by 4.30pm, the church’s session clerk, Ed Martin, will mix cocktails for those who want them.